Whenever a spring storm strikes the Bourbonnais area, heavy rain or snow is possible. If high amounts of precipitation occur, you may find yourself needing to call in a professional flood removal company such as SERVPRO. During the spring, it is possible to see snow storms that bring in significant amounts of wet, heavy snow. Once the snow melts when the sun comes back out, moisture melting off of it can find its way into your home. Sometimes the snow melt can work its way slowly into your Bourbonnais home without you noticing it right away. Even if no standing water is visible, your building materials and contents could have still retained moisture. Many times when our SERVPRO team shows up at your flood removal project in Bourbonnais, all of the liquid water that was once present has soaked into your building materials and structural components. Once melted snow leaks into your house, it elevates the humidity level inside the structure which can cause issues throughout the building. The moisture can also saturate building materials such as your drywall or carpet and cause them to lose their structural integrity. Wet organic substances can become prime spots for future mold growth. In situations where there is little or no liquid water present, our SERVPRO technicians begin the structural drying process immediately. We set up dehumidifiers and air movers to create an environment conducive for rapid evaporation and drying. When several of your building materials got saturated, we utilize more dehumidification to help pull moisture out of your structural components. Refrigerant or LGR dehumidifiers work best for removing moisture from porous materials. Desiccant dehumidifiers are more forceful and used in more severe situations where moisture has soaked into solid, non-porous substances like concrete. Desiccant systems work by pulling wet air across a silica gel that attracts water molecules. The machine then heats the gel so that the moisture evaporates into a separate air stream which vents outside of the building. If you ever notice wet building materials after a spring storm, call SERVPRO of (815) 935-0077 Kankakee County at any day of the week. Read more about Bourbonnais here. If a fire breaks out in your home you may have only a few minutes to get out safely once the smoke alarm sounds. Everyone needs to know what to do and where to go if there is a fire. 1. 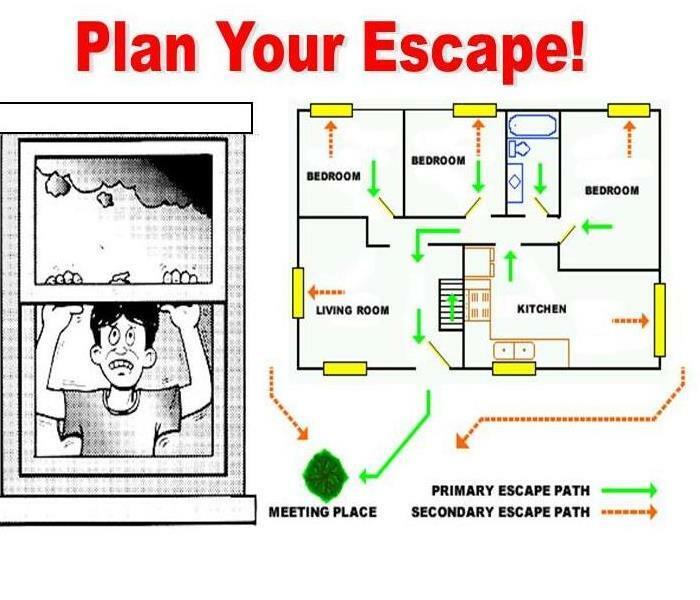 Make a Home escape plan. Draw a map of your home showing all doors and windows. Discuss the plan with everyone in your home. 2. No at least two ways out of every room, if possible. Make sure all doors and windows leading outside open easily. 3. Have an outside meeting place like a tree, light pole, or mailbox. Make sure it is a safe distance from the home where everyone should meet. 4. Practice your home fire drill at night and during the day with everyone in your home at least twice a year. 5. Practice using different ways out. 6. Teach children how to escape on their own in case you can’t help them. 7. Close doors behind you as you leave. 1. If the smoke alarm sounds get out and stay out! Never go back inside for people or pets. 2. If you have to escape through spoke, get low and go under the smoke to your way out. 3. Call the fire department from outside your home.
! A closed door may show with the spread of smoke, heat and fire. Install smoke alarms inside every sleeping room and outside each sleeps area. Install alarms on every level of the home. Smoke alarms should be interconnected. When one smoke alarm sounds, they all sound.
! According to an NFPA survey, Only one of three American households have actually developed and practiced a home fire escape plan.
! While 71% of Americans have an escape plan in case of a fire, only 47% of those have practiced it.
! 1/3 of American households call made an estimate thought they would have at least six minutes before a fire in their own home would become life-threatening. The time available is often less. And only 8% set their first thought on hearing a smoke alarm would be to get out. Is Professional Remediation Necessary After a Manteno Fire? SERVPRO has the expertise to restore your fire damaged home. Call us today! After a fire incident, many homeowners naturally want to do something to fix the situation. Sometimes, the steps you take can worsen the state of affairs, so it is essential to know what to do after such incidents. Immediately calling a professional restorer is the ideal response because the crewmembers are trained to handle such situations. We offer professional restoration services in Manteno, and IICRC certifies our crews in Fire and Smoke Restoration. Although you might feel the need to clean up surfaces or items after incidents of fire damage in Manteno, you should avoid doing so. Some cleaning actions can exacerbate the situation or have no impact on general restoration efforts. For example, trying to clean walls can transfer the soot residues from the walls to materials on the floor staining them. Some ash residues might also be present in the areas you want clean, and they can cause problems if inhaled or exposed to your skin. Our SERVPRO technicians handle the process better because they have PPE, Personal Protective Equipment, and we use systemic procedures when cleaning up. Movement around the fire-damaged house can cause additional damages by spreading soot, ash and other residues around the house. Touching different contents with soot-covered hands can impregnate upholstery, walls and wooden materials with soot residues causing additional damages. Our SERVPRO technicians evaluate damaged materials separating them into salvageable, unsalvageable and questionable categories. We can also pre-clean some of the salvageable materials ensuring the occupant has access to what he or she needs thus eliminating the need to venture into the damaged house. Soot residues are acidic so that they can corrode or stain different materials in the house. There is a need to protect materials with chrome or other metallic finishes and stone surfaces such as granite. Our SERVPRO technicians pre-clean these areas then apply a thin coat of lubricant to protect them until it is possible to do thorough restorative cleaning. For the right response after fire incidents in Bourbonnais, Bradley, and Kankakee areas, call SERVPRO of Kankakee County to help. 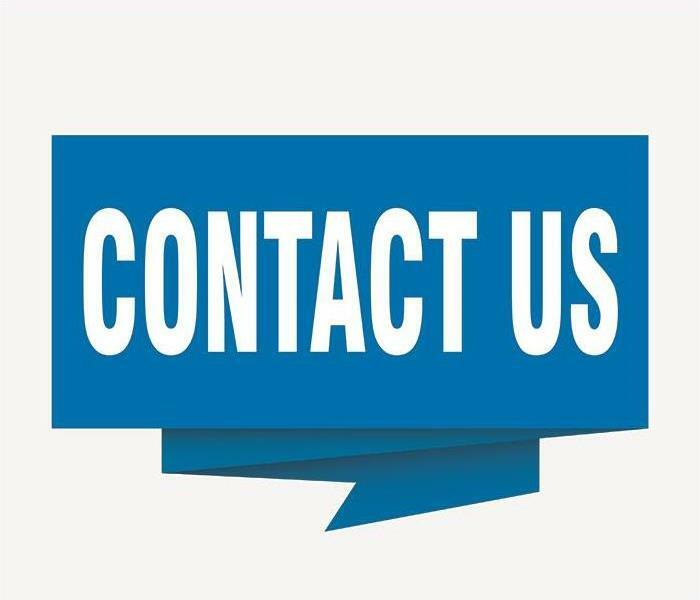 You can reach us at (815) 935-0077 any time. We’re Faster To Any Size Disaster. Learn more about Manteno here. Marketing Representative Angela Kuelper with future SERVPRO employee, her son Vincent. This past weekend SERVPRO of Kankakee County had the chance to take part in an event for area fire fighters and police! Peotone Fire Department held their 7th annual Fire & Police Swap Meet at the Will County Fair Gounds in Peotone. This swap meet has been a great success over the years attracting people from as far away as California! We were very proud to be able to support such a great event and our local Police and Fire departments. 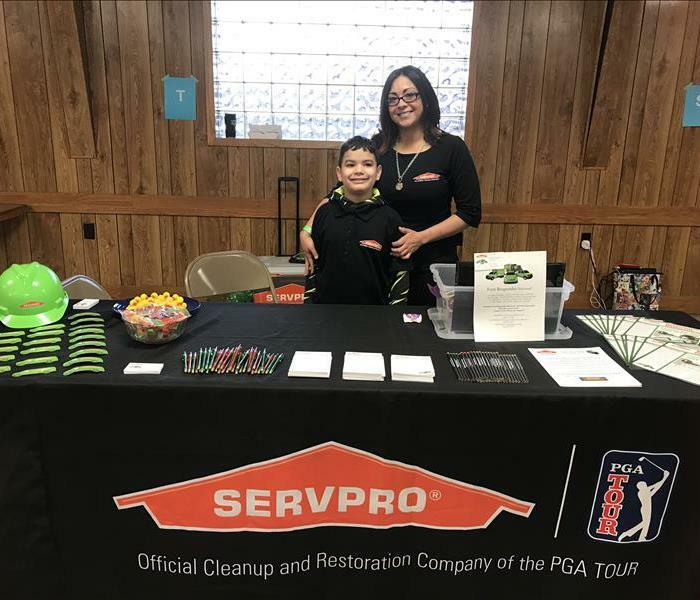 SERVPRO of Kankakee County marketing representative Angela Kuelper was onsite to answer questions and get to know more about the community that we serve. At SERVPRO of Kankakee County we love to do these local events. Community involvement is one of the biggest things that sets us apart from out competitors. To see where we will be next or other past events visit us and like us on Facebook at www.facebook.com/SERVPROk3. Also be sure to check back to the page for more news, tips, and events or call our friendly office staff at (815) 935-0077 24 hours a day, 7 days a week, 365 days a year! Kankakee Properties, Storms, and Fallen Trees? Call SERVPRO--Fast! Trees can line your property or add some aesthetic appeal to your Kankakee yard. When wind storms occur, however, these appealing fixtures of your property can fall victim to broken limbs or becoming uprooted entirely. While many threats exist when heavy branches or full trees fall over towards your home, damage to your roof from a tree can allow flooding to occur almost immediately in your home if torrential rainfall is already occurring. 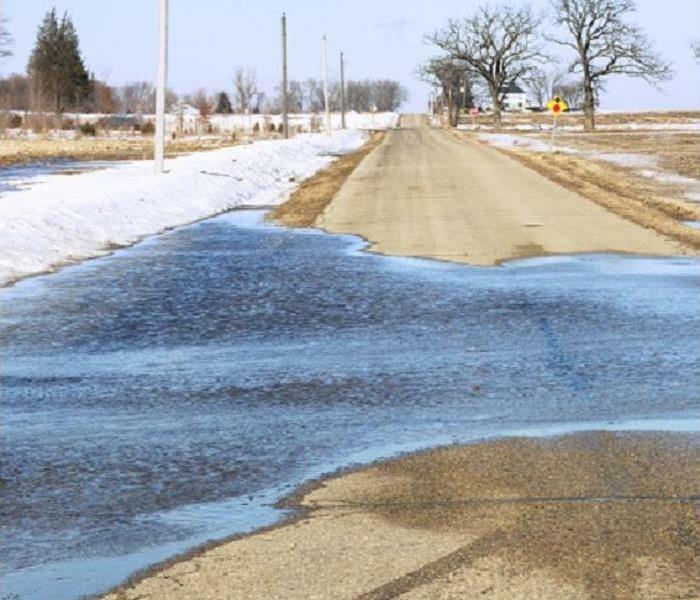 Finding the right professional assistance for the potential flood damage that could occur in your Kankakee home should not be a difficult endeavor. With our 24-hour response to emergencies and our industry-leading equipment for fast mitigation and restoration, our SERVPRO team has become a trusted name throughout the area. We strive to ensure that no customer waits for the effective approach of our professionals when faced with an emergency, and our team is ready at a moment’s notice to provide disaster relief even amid the storm. We can arrive promptly to your home and immediately get to work on emergency board up services to protect your property from further damage from the elements. This task gets overseen by our contracting division, and these professionals have years of hands-on experience in the construction industry to provide efficient and cost-effective reconstruction and renovation to damaged areas of your home immediately after the mitigation. This same team of professionals within our SERVPRO crew can remove the tree that still threatens your property. Once the tree gets officially removed from the roof or against your home, our experts can get a better look at the full scope of the damage to your roof or siding and what material and personnel are necessary to build it again. For starters, we can place tarps or boards to reduce any rainwater water intrusion and keep out pesky wild animals. Once mitigation completes, our contractors can get to work on the steps necessary to reconstruct and rebuild your damaged roof. 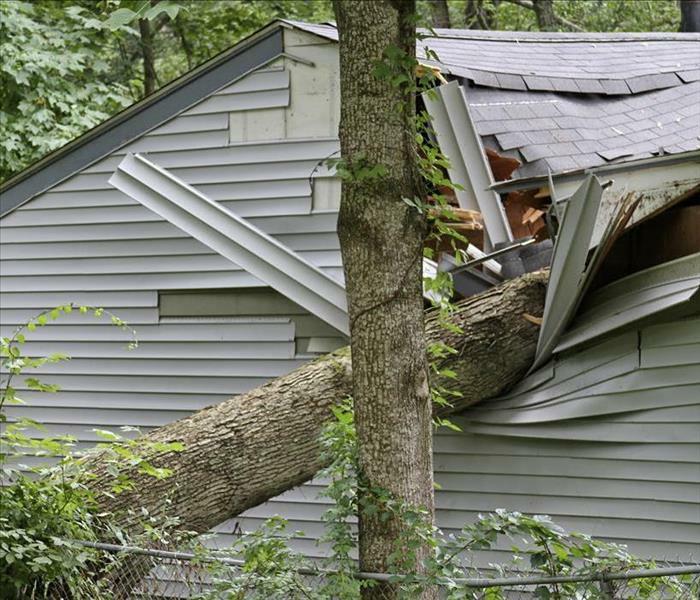 You cannot predict the vulnerability of some of the trees on your property against high-powered wind storms, but if damage does occur to your home, you can count on our SERVPRO of Kankakee County professionals to restore it. Our dedicated technicians and contractors are available 24/7 by calling (815) 935-0077. It’s that time of year when weather conditions can become hazardous in a matter of minutes, why not consider becoming a Storm Spotter. Q. What is a storm spotter? A. The National Weather Service's (NWS) primary mission is to save lives and protect property through the issuance of warnings for hazardous weather. The WSR-88D Doppler Weather Radar is a great tool for detecting and tracking potentially severe storms and essentially all strong and violent tornadoes. However, NWS meteorologists also depend on real-time reports from trained spotters to know exactly what is occurring on the ground under a storm. The NWS trains people to identify severe storms and tornadoes and report them via organized communications networks (primarily local and county emergency management, law enforcement and amateur radio). Q. What is the difference between a storm spotter and a storm chaser? A. A storm spotter is volunteer or paid county or municipal employee who is spotting as a community service. Most spotters work as part of an organized network and are in communication with their community or organization, which is in turn in communication with the NWS. Some spotters are "mobile" spotters in vehicles, but most spot from fixed, strategic locations around the community or county. The purpose of spotting is to alert community officials and the NWS and assist them in warning the public. Schools, hospitals, and other facilities are encouraged to have spotters to alert people in their care of impending severe weather. Storm chasing involves following a developing thunderstorm to view or photograph severe weather phenomena. Chasing may be done for educational purposes or scientific research but is mostly done for personal fulfillment. Q. I want to be a storm chaser. What should I do? A. College of DuPage in Glen Ellen offers storm chasing field trips that are open to students and the public. The Valparaiso University Meteorology Department offers storm chasing as an educational tool to 3rd and 4th year meteorology students. There are private firms, mostly in the Great Plains, that offer storm chase tours/vacations. Many can be found through an internet search. Q. How do I become a spotter? A. Attend a basic tornado and severe weather spotter class. Classes are held throughout the area, they are free and open to the public. The class takes about 1 ½ to 2 hours. Most classes are held weekday evenings, but there are a few daytime and Saturday classes. The training is generally done in late winter and early spring - before severe weather season. The training consists of a slide and video program which teaches potential spotters about severe storm structure, and how to identify cloud features and other environmental clues to identify severe storms and tornadoes. Communications systems and spotter networks are explained so the spotter knows where to report, and how that information is used by the NWS and local officials. A complete schedule of classes can be found on our website from about late January through April. Q. Is there a minimum age requirement to become a spotter? A. Because of the complexity of severe thunderstorm structure and development, and the potential danger involved, spotting is recommended for adults. People of all ages attend spotter training classes. Those ages 10 and up are likely to get the most from the class. Youth who are interested in attending a spotter training class are welcome to attend with a parent or other adult. Q. I have already taken a spotter class. Where can I learn more? A. The National Weather Service encourages spotters to be retrained every 2 years. In addition, spotters can attend the Advanced Severe Weather Spotter Workshop at Lisle . The Advanced Spotter class is usually held on a Saturday in early March. It is an all-day class. There is a registration fee that covers the cost of the speakers, lunch and refreshments. More information will be given when the date is set. Q. Does the NWS issue a certificate or spotter ID number? A. The NWS does not issue spotter ID numbers. Certificates are available on request. Some county emergency management agencies issue IDs and/or certificates. Please check with your local officials. Q. Does the NWS have any training material? A. In the past, the NWS has been able to hand out copies of the Basic Spotters' Field Guide. However, due to limited printing this year, the NWS has made the Field Guide available online. You can find it at: https://www.weather.gov/media/lot/spotter/basicspotterguide.pdf. There is also a version of the Weather Spotter's Field Guide in Spanish too. After A Fire In Your Manteno Boutique, Call Our Experts Immediately! Give us a call whenever you need us at (815) 935-0077. While you might not understand all of the ways that disasters can affect your Manteno boutique, a situation like a fire can present multiple threats that require immediate attention. While you already have the stress of getting your doors back open to your customers after a fire has occurred, you might not fully understand the severity of the situation or what needs to happen to return your building to its original condition. Our professionals can work quickly to assess the scope of the damage and determine what approaches are necessary to recover your store and get you back to business as usual. Smoke effects are a common fire damage element that can vary between disasters, and understanding what type affects your shop can be helpful to appreciate the steps required to restore it. Smoke damage in Manteno can often spread far throughout the building, affecting areas that were not in the initial combustion area. These effects can be a noxious odor that becomes embedded in the walls and contents of the shop or with a residue from the smoke particulates. Two main types of smoke affect buildings and these get determined on the heat of the fire itself. For lower temperature, smoldering situations, wet smoke residue gets distributed throughout your property. These effects present a thick film of particulates that require intricate cleaning techniques from our SERVPRO professionals to recover. Attempting to clean these damages on your own can allow for staining, which can prove impossible to reverse. Higher temperature blazes produce a dry smoke, which still spreads a residue of particulates throughout the affected areas of your building. The affected surfaces and materials from this type of smoke get coated in a thin and easily cleaned powdery residue, often mistaken as ash. With our efficient and effective cleaning tools and equipment, our SERVPRO professionals can quickly and completely remove these effects. Smoke damage can prove problematic for your boutique, but our SERVPRO of Kankakee County professionals can help with a fast response and the expertise to get the job done right. Give us a call whenever you need us at (815) 935-0077. Click here for more about Manteno. Left starting from scratch after fire damage has turned your home upside down? Call SERVPRO to help with all your remediation needs. At just an hour south of Lake Michigan, Manteno is a perfect, little town just off I-57. Residents and visitors call it picturesque, and they are correct. Even so, our community still has its share of fires and other disasters. When a homeowner must deal with fire damage in Manteno, the only way to ensure complete restoration is to hire an experienced company with an extensive inventory of tools and cleaners. Every SERVPRO office has access to a nationwide support network. With it, our restoration specialists can perform nearly every task except for total reconstruction of a damaged home. 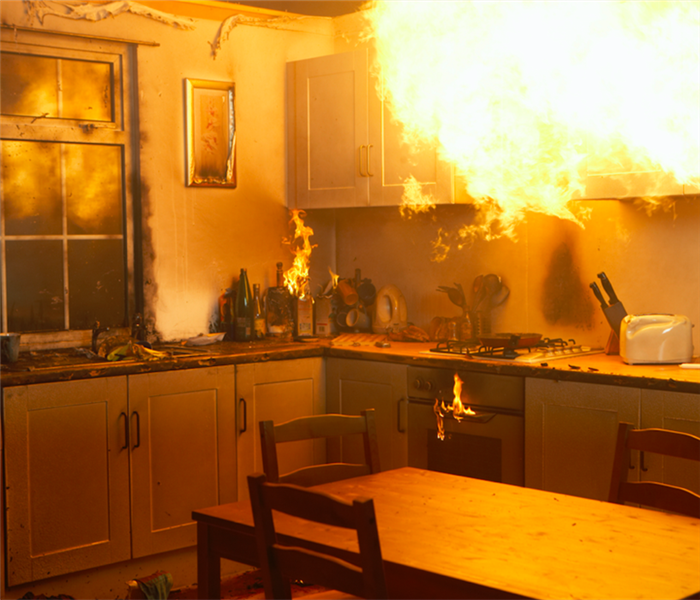 House fires usually start in the kitchen and either burn themselves out or get extinguished quickly. 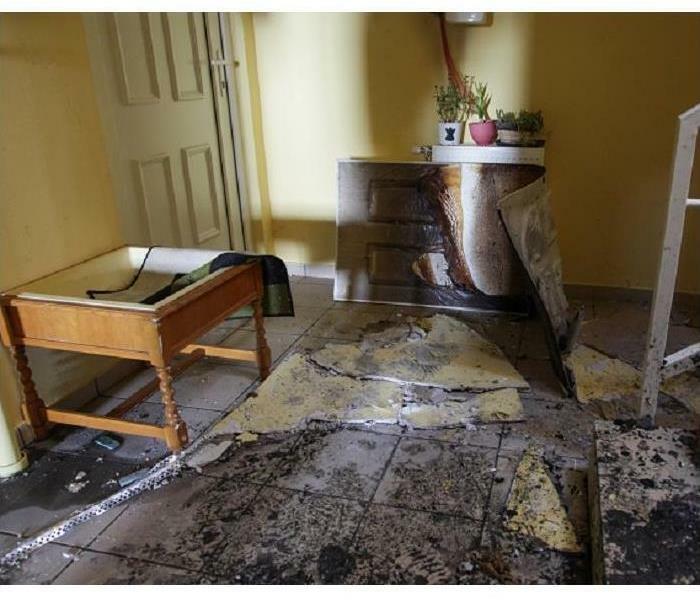 Common forms of damage include scorched ceiling and wall tiles, melted or warped flooring, and residue deposits from the smoke. For physically damaged items, SERVPRO specialists quickly remove all drywall, appliances, flooring, and ceiling tiles. It clears the home so they can clean, but disposal also reduces the number of odors left behind after the fire. Our team members break down and bag everything when possible to avoid accidentally spreading ash or soot throughout the home. After clearing out the kitchen, personnel clean everything remaining from floor to ceiling. If not removed quickly, residues can continue to eat away at surfaces while also continuing to generate odors. Specialists have access to cleaners tailored to both dry or wet residues and the type of surface they settled onto such as porous wood tables and nonporous surfaces such as marble countertops. As team members clean the salvageable items, others begin construction where needed. Specialists replace interior wall framing that cannot be cleaned of residues and then hang new drywall panels to enclose the kitchen from the rest of the home again. As the walls go up, personnel can also lay in new flooring to include wood, commercial carpeting, or vinyl tile. Regardless of the level of damage or where it may be, SERVPRO of Kankakee County quickly works to remove or clean it from your home. If you have had even a very small fire in your home, call us at (815) 935-0077 today to schedule a visit. We are here for you. The MABAS Division 7 / Kankakee Valley Fire Chief’s Association is made up of 17 fire departments and 20 associate members. MABAS Division 7 covers Kankakee County, located approximately 50 miles south of Chicago, Illinois. Division 7 is dispatched by KanCom Dispatch located in Kankakee, Illinois. The fire departments associated with MABAS Division 7 provide fire suppression, EMS, rescue, and specialized response teams that allow the division to handle and mitigate. SERVPRO of Kankakee County is honoured to be an Affiliate Member of MABAS Division 7. These dedicated men and women protect out lives and property twenty fours a day three hundred and sixty five days a year. They are our friends and neighbours, they till our soil, work in factories and offices. When the “call”comes they are there to save our lives our pets and our properties. They educate the residents and business community about fire safety. MABAS-Illinois serves local fire agencies, MABAS Divisions, State of Illinois departments, and Cook County UASI-DHSEM by providing a systems-based resource allocation and distribution network of robust traditional and nontraditional fire-EMS-rescue and special operations teams for emergency and sustained response within and outside of the State of Illinois. Accomplishment of the services requires cooperation, standardization, reliability, partnering, brokering and ongoing communication and compliance with customer specification and expectations. Customer trust and reliance on the MABAS system is built upon personal relationships, credibility, and ongoing customer support. The Mutual Aid Box Alarm System (MABAS) provides emergency rapid response and sustained operations when a jurisdiction or region is stricken by an overwhelming event generated by manmade, technological, or environmental threats. In response, MABAS will mobilize and, deploy a sustained fire, emergency medical services (EMS), hazardous materials, technical rescue, water rescue, urban search & rescue, and incident management assistance team resources to prevent loss of life, human suffering and further damage to property. The spring rains are almost here and when they arrive, they will bring thunderstorms and power outages with them. Torrential down pours can knock out power lines and quickly overwhelm sump pumps. Battery back up systems usually will only last about 45 minutes during a big down pour, no matter what the box you bought it in said. Having the right insurance coverage is only part of the equation, if you haven't spoken to your agent to make sure you have it, don't wait anytime. The second part of that equation is having the support team ready to answer your call when you need help drying out your home or business. That's when you call SERVPRO of Kankakee County! Available 24/7/365 SERVPRO is only phone call away. Our trained and certified technicians will be there to help you through the claims process. Commercial building or residential home, no job it too big or too small. Think you have a commercial structure with a large loss in Kankakee County or any of the surrounding Counties? You want our Disaster Recovery Team. SERVPRO has been leading the way nationally in commercial restoration, just ask for Team Nichols. 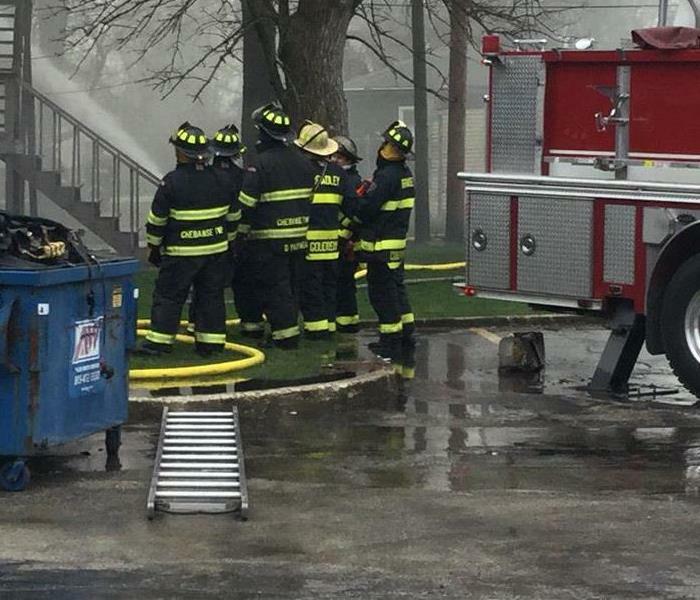 4/2/2019 - Is Professional Remediation Necessary After a Manteno Fire? 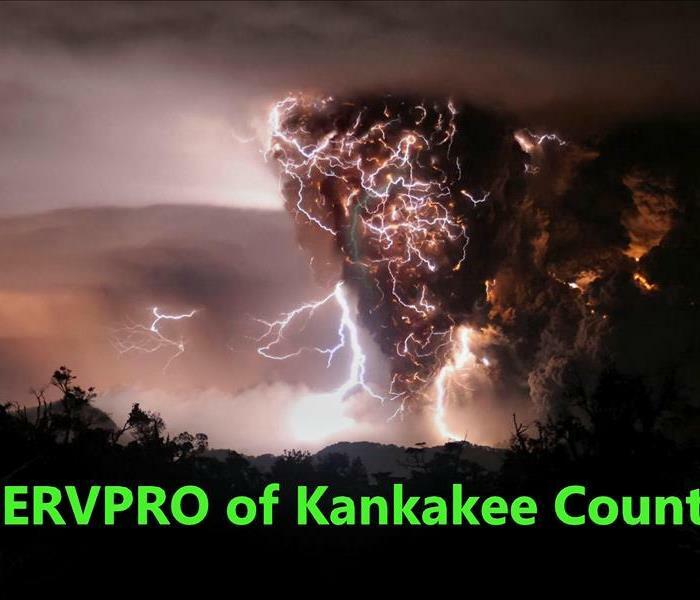 3/19/2019 - Kankakee Properties, Storms, and Fallen Trees? Call SERVPRO--Fast! 3/11/2019 - After A Fire In Your Manteno Boutique, Call Our Experts Immediately!